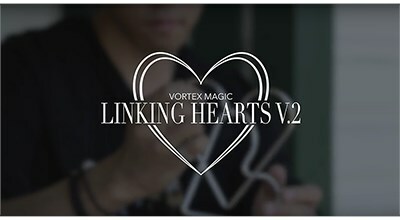 Vortex Magic has permission to offer a very limited supply of Linking Hearts with a brand new routine by Mike Liu. This is a Linking Ring Routine that offers more possibilities than any other close-up linking ring routine on the market. Mike Liu has created one of the most commercial routines for magicians who perform close-up, walk-about or street magic. These rings are specially designed and crafted using high quality 5" metal, and plated three times to make them durable enough for the toughest working conditions. They are the perfect size to fit in your pocket making them one of the most commercial routines for magicians today - the performance possibilities are endless. Because of the Heart Shape Rings it is possible to do links and unlinks that are not possible with standard linking rings. When you purchase these you will have access to a tutorial video teaching you Mike's own personal routine. Four 5" Heart Shaped Rings - two linked, a single and a key ring. Access to a tutorial video of Mike teaching his Four Ring Linking Heart Routine. LIMITED SUPPLY - once they are gone no more will be made - only 400 sets left.